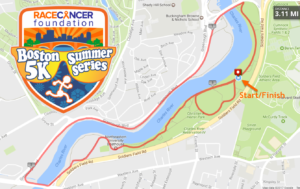 All races are held at the DCR’s Herter Park on Soldiers Field Road, and run on paths along the Charles River. Each event includes a post-race party at Miller’s Boston Ale House with beer generously provided by our brewery partners. 100% of the event proceeds go to charity. 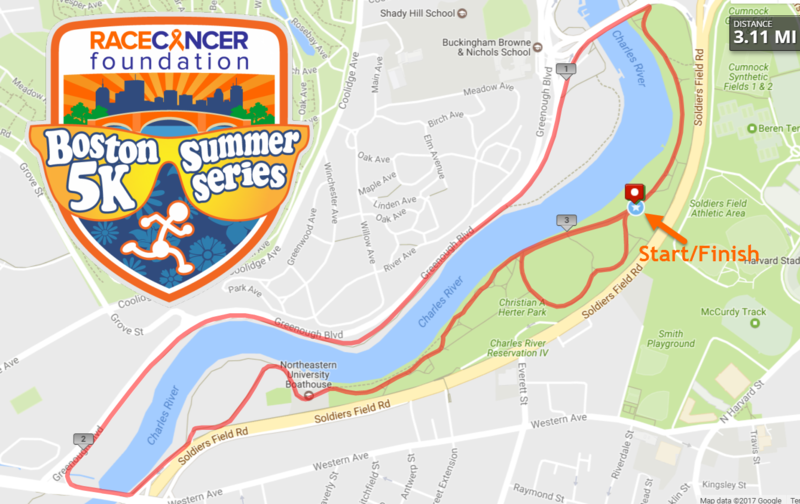 RACE Cancer Foundation’s Boston 5K Summer Series provides funding for the Sunscreen Squad, bringing free sunscreen to running events across Massachusetts. 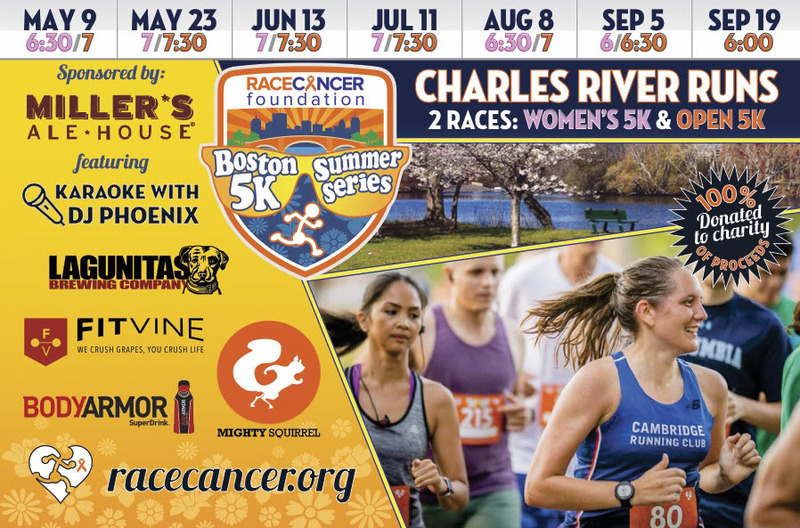 Sign up for each 2019 Boston 5K Summer Series race at racemenu.com/summer! These are chip-timed races. All entrants get two free drinks (beer, wine, hard cider or hard seltzer) at Miller's Ale House after the race. 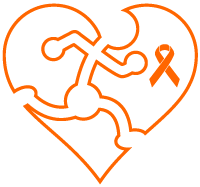 Women can run either or both the Women's 5K and the Open 5K with their one entry fee. 100% of proceeds to charity. Number Pick-up & Raceday Registration: Opens 30 minutes before the race. Bag check: As always, we will have free, secure bag check. No double-dipping. Top 3 overall excluded from AG awards. Scoring points, explained: Overall winners (female & male) each get 1,000 points. Then we’ll divide the winner’s time by your time and multiply it by 1,000 points to determine your score in each race. Your top 5 (of 7 total) races will count towards the season standings. 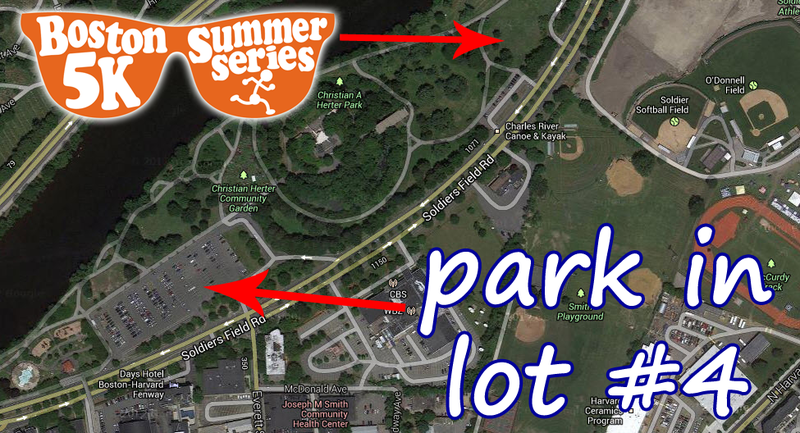 Parking: There’s a large parking area (lot #4) at 1101 Soldiers Field Road – the dog-leg for Everett Street, ~150 yards past (west) of the race start area.